Got an anti lock ABS warning light on? We are a team of ASE certified mechanics who have created this guide to help you fix a problem with your ABS brake system and save a considerable amount of money in the process, or at least see what you are paying for when having it repaired. ABS stands for "anti-lock brake skid" safety control system. 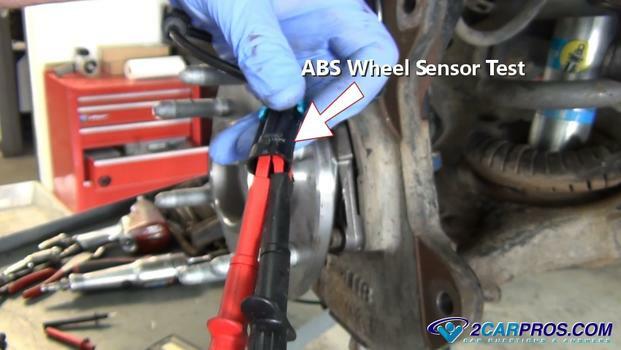 Anytime there is a problem with the ABS brake system it will turn the warning light on. This is to alert the driver that this safety system is no longer active and has been disabled. Let's jump right in. The anti-lock brake system (ABS) helps to maintain control and directional stability of an automobile in case of extreme braking circumstances. When one or more tires begin to skid they loose traction allowing the vehicle to go in whatever direction is wants, even completely sideways. Research has shown that a vehicle with an anti-lock system can decrease the chance of a vehicle accident by 18%. This is achieved by controlling the rotational speed of each wheel by metering the brake line pressure. Wheel speed sensors are located near the wheel and monitor their rotation speed. This information is then sent to the computer module which computes data from all four wheel sensors. If the computer see's one or more of the wheels turning slower than the others it signals the valve to dump brake line pressure and then have the pump maintain this pressure to allow the wheel or wheels to start rolling again. This is why you will feel the brake pedal vibrate when the system is activated which is normal. When the ABS system detects a problem a fault code is generated and then stored in the system memory which turns the warning light on. Most ABS systems are "real time" so when a code has been triggered and then repaired the code should clear itself within a few minutes of driving. Though early designs were comprises of many parts today's systems are much more basic and include a main computer module, a valve and hydraulic pump assembly and four wheel speed sensors one at each wheel. This simplifies repairs and makes the cost of the parts more reasonable. Here is a video that will show you what you are in for so you can feel more comfortable about the repair. Once you have watched the video continue down the guide for more detailed information which is updated regularly. We present the easiest things to check first before heading to the more complicated stuff. Once you have determined you are going to fix the problem, park the car on level ground with the transmission in park and the emergency brake set with the engine turned off. You may need to jack the car up to remove a tire or replace a control module. Always stay safe by using jack stands when lifting a car for repairs. Through this guide you may need to remove a tire for testing or part replacement purposes. The brake caliper and pads may also need to be removed when replacing a wheel speed sensor. There are two ways to go about this repair. Either you can purchase a code reader capable of reading ABS codes for about $44.00 from Amazon or you can start checking the system manually. 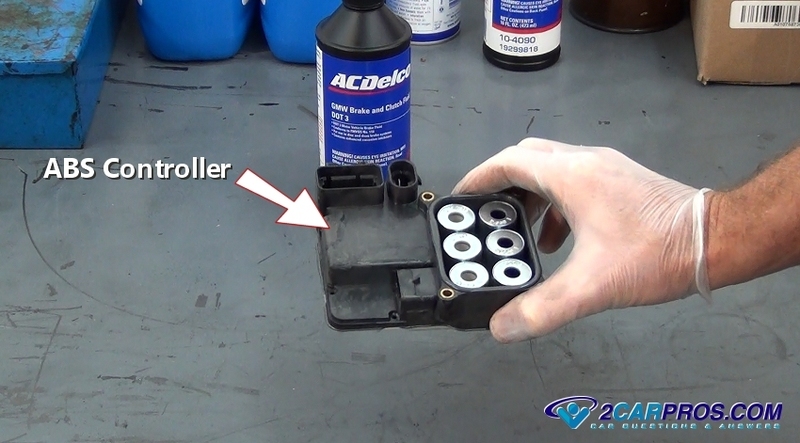 Most ABS diagnostic codes can be accessed by the ALDL connector much like the engine computer control system. When this warning light flashes or stays on steadily it means the system is disabled. So if you are in a situation where the car needs this safety system it will not work and you could lose control of the vehicle. An anti lock warning light will be in different places in the instrument cluster for each car, and it maybe accompanied by a red warning light. The abs system is like any other electrical system and is protected by a fuse that can blow if an electrical surge occurs or if the fuse ages. If the fuse is blown and you replace it and it blows again there is a short circuit in the system which is usually the ABS computer or pump motor. 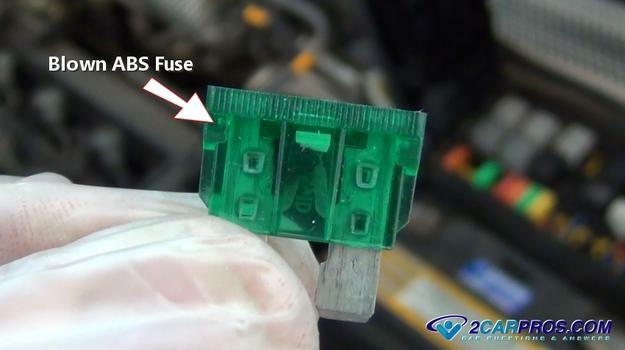 This ABS fuse is located in the fuse panel under the dash or the power distribution center under the hood. The wheel speed sensor is used to monitor the wheel rotation which is then controlled by the ABS computer. This sensor is used in conjunction with the wheel stator which is attached to the CV joint, axle brake rotor or bearing hub. These sensors are subject to road conditions and vibration which can cause them to short out. Follow the guide below to perform a test using a voltmeter. If after testing the sensor or if you have scanned the ABS computer and get a trouble code C0035, C0040, C0041, C0045, C0046, C0050, C0051, C1221, C1222, C1223, C1224, C1225, C1226, C1227, C1228 , C1232, C1233, C1234 or C1235 the sensor is either unplugged or it has shorted out and needs replacement. This job is not to difficult and can be done using basic tools and a floor jack. The ABS controller is used to monitor the wheel rotation speed and can go out as electronics sometimes do. This computer module is located on top of the pump motor and is attached by four or five mounting bolts. If the ABS system stays on after the key is turned off which is indicated by a humming noise or you have scanned the system and one of the valve control coils has burned out the unit needs to be replaced. 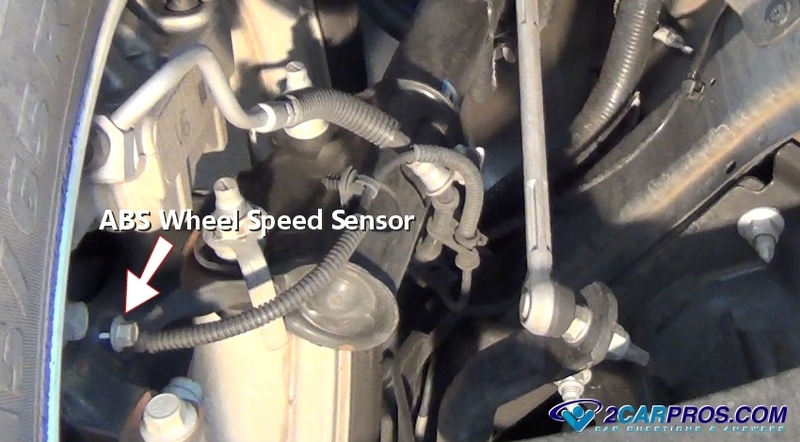 The wheel speed sensor works in conjunction with the sensor to monitor the speed of rotation of the wheel. If this ring gets damaged it can cause the system to malfunction. If this ring becomes dislodged or damaged in a way that the teeth are missing the system will constantly be activated because it thinks the wheel is rotating slower then the others. In this case these rings must be physically inspected. There will be no warning light on for this problem. The location of these rings will vary, some are in plan sight as shown below, but others can be located internally within the bearing hub or differential housing. If you have any questions and need more information about this guide please visit our forum where hundreds of ABS light questions have already been answered by our certified mechanics. 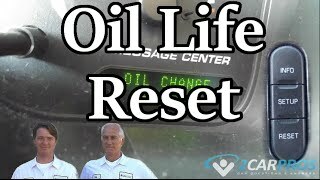 Be observant when first driving the vehicle after repairing the ABS system. Listen for abnormal noises or performance issues that could indicate a problem which will need further inspection. No code clearing is required in most cases for American built vehicles. Some older European and Japanese models may need to be cleared using an ABS code reader. 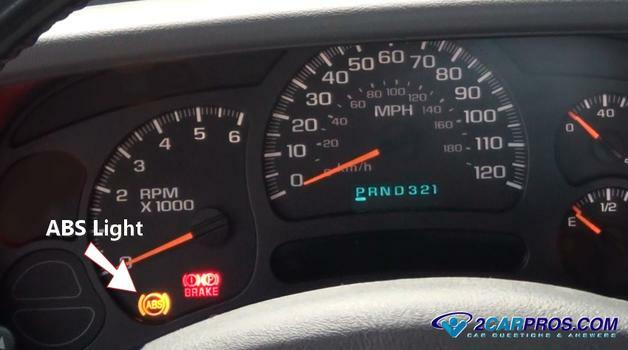 If the warning light remains on after code clearing it means you still have a problem. 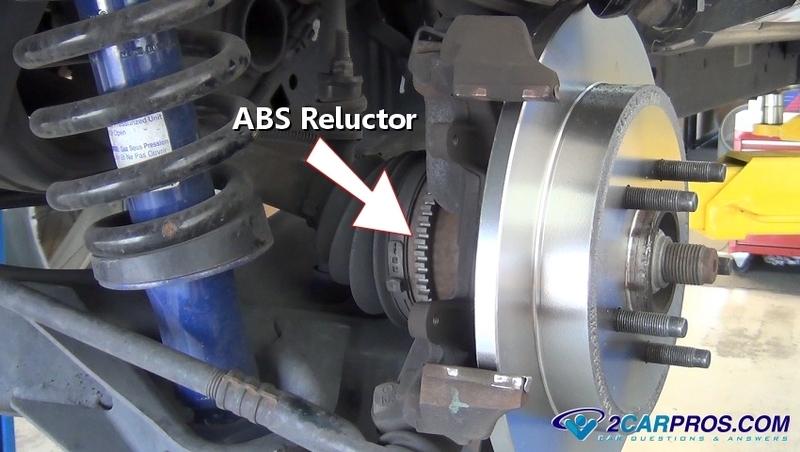 If you have any questions about ABS brakes visit our forum. There are various tools and supplies you will need to perform these jobs. We have created a list for you which are easily obtained if you do not have them already. You will also need replacement parts such as a wheel speed sensor, computer module or system fuses. We have created a guide that will inform you where to go to get the best deals and quality. To see more specific information about your particular vehicle check out our repair manual information guide. Anyone can do car repair if he or she puts their mind to it. If you are a parent please show your kids how to do repairs because they will need to know this valuable information as well. Doing the job for yourself, family and friends will give you self satisfaction and pride which you can only get from doing the job right. 2CarPros will be there for you every step of the way with our repair guides, and if you have any questions our team of mechanics will answer them for free.